(On Cable TV, December 2017) I really wasn’t expecting much from Yankee Doodle Dandy other than checking off a list of classic movies I should see, so imagine my surprise when I started to be honestly engaged in the film. Initially drawn in by the time-capsule aspect of the film (as a 1942 framing device leads us to late 1800s vaudeville, and then the birth of Hollywood musicals), I really started enjoying myself in-between the honestly funny comic routines inspired by state work and the birth of American musical movies. Academy Award-winner James Cagney (looking like a young Anthony Hopkins?) shows some serious skills in giving life to actor/composer/dancer George M. Cohan through some sixty-some years. By the time the film ends, we’ve been given front-row seats to a highly dramatized depiction of the evolution of American entertainment from theatre to movies, as well as a full biography ending with a striking piece of palatable pro-American patriotism both in topic matter and presentation. The re-creation of lavish stage spectacles is striking, many of the tunes are toe-tapping good and the film remains sporadically very funny even now. Add to that some directorial flourishes from Michael Curtiz (most notably a sequence charting the evolution of Cohan’s Broadway shows) and you’ve got the makings of an unexpected great movie that has appreciated in the seventy-five years since its release. 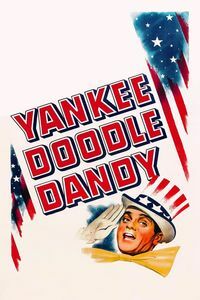 I’ve been watching more older movies lately, and Yankee Doodle Dandy is the kind of happy discovery that will keep me going deeper into the archives.